Here is Gracie trying to work out what I was doing with the camera. She'd been playing with her favourite toy - a three metre piece of linen that we call her "ribbon". She runs all over the place dragging it and trying to entice someone to pull on the other end. Naturally, there are two suckers here who are happy to oblige. If you're struggling with the Christmas season, there is a complete 28 day challenge on the forum, written by Sherri, that many members have been helped by. It is a simple step-by-step guide to how to prepare yourself and your home for the holidays. Click here to go there. Is it possible to be a frugal and ethical shopper? There are hundreds of small black mosquitoes here since the rain and we've got mosquito coils burning when we sit outside. I did a bit of research and found this: Are mosquito oils making us sick? Thank you for the beautiful and interesting comments you leave here during the week. Hanno and I enjoy reading them very much. How can you bear it, Rhonda, lol, the adorableness of that sweet face! Me too, can I come, about the same distance from Michigan 😢 The Simple Life on YouTube ? Now there's a thought Especially with the wee black bundle in the picture too! Ah I always learn from you and I won't be able to go. Your Gracie is amazingly sweet. Oh my goodness she is the cutest pup around!! wow Gracie is growing so fast! look at those ears! those eyes aren't they so innocent? glad she is bringing you & Hanno so much joy! Rhonda, I predict Caboolture library will be a sea of people next Friday. I do so wish I was just a short drive away. 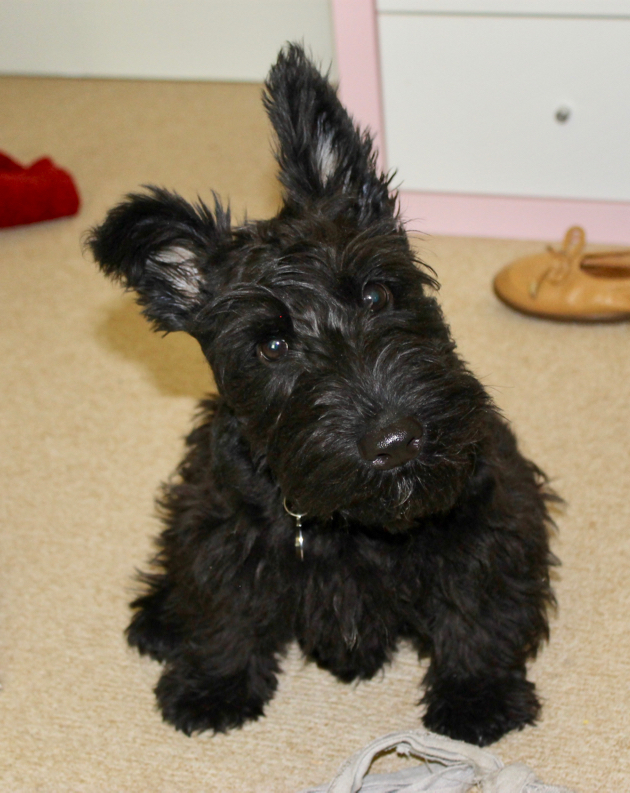 Gracie's ears are standing up perfectly now, darling wee thing! Toothpaste also removes marker--even Sharpie--from finished wood furniture. Applied very lightly and in the smallest amount necessary to achieve results, it did not even damage the finish. I imagine Hanno having that smile "I knew it... :))"
The photo of Gracie is so cute! I just have to tell you that little Gracie is the sweetest little thing. I bet she puts a smile on you face every day. Treasure her. She is a dear. Hmm, Hmmmm big grin! That shot of Gracie is just gorgeous. Are you sure that Gracie is real? She is so cute, she almost looks like a toy! Gracie is just the cutest little sweetie! I always look so forward to your weekend reading lists! Gracie is just so adorable!!! I was tickled to see your link for the small batch peach jam. Marisa is my cousin!